Long before the days of YouTube, Vimeo and being able to watch music videos wherever and whenever you damn well please, I remember spending quite a bit of time as a 12-year-old kid scoping out MTV, hoping certain videos would appear on the screen before I had to switch it off and go do something else. One of those videos was Garbage's "Stupid Girl." I remember being bewitched by Shirley Manson in that video, thinking she looked a bit pissed and intimidating, and finding that pretty great. That video began a long-term fascination with Garbage--a fascination that somehow never involved me seeing them live. Until this week. 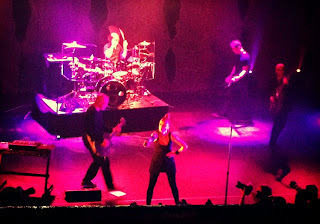 After many years and many missed opportunities, Garbage's Wednesday night show at the Riviera--their second Chicago show in support of their 2012 album Not Your Kind of People in one year--finally found me catching one of the select few bands I've been following ever since I was just an awkward, moody adolescent. Before Garbage would hit the stage, though, I'd have to sit through L.A.-formed shoegaze act IO Echo. I hadn't heard anything from the band before, and when that's the case I go in with expectations relatively low. Surprise, surprise--they turned out to be pretty excellent. In fact, they had my undivided attention throughout their entire set, which featured a mix of both slow-burning and punchy fuzzed-out confections, made to sparkle by the spritely voice and presence of frontwoman Ioanna Gika, who danced around the dimly-lit stage in a kimono while she sang. They had me so sold that I even bought their new record, Ministry of Love, after the show. As for Garbage, I decided to go into the show without looking up the setlists they've been playing on this tour so that I could be surprised. And I was, when the band came out and kicked into the full-on guitar crunch of "Bad Boyfriend," a non-single from one of their most under the radar albums, 2005's Bleed Like Me. Opening with that song signaled that it wouldn't be a predictable show, and it wasn't. Not only was it an unexpected surprise to hear other deeper cuts from the G catalog such as "Cup of Coffee" from 2001's beautifulgarbage and "As Heaven Is Wide" from the 1995 self-titled debut album (a song Shirley mentioned they haven't played since the '90s), but having been a newbie to their live show I also wasn't expecting Shirley to be as animated as a front person as she was. She danced with purpose through every song that was danceable--at times like a woman possessed--and even dropped down to do a few push-ups at one point. She's also very casually funny; near the end of the night I'm pretty sure she informed us, through her pronounced Scottish accent, of a throat lozenge stuck in her teeth. As welcome as the setlist surprises were, though, it was hard not to find the familiar the most exhilarating. Garbage's most popular albums--the debut and 1998's Version 2.0, and their corresponding hit singles--were well-represented, and if the band is at all sick of playing them, you couldn't tell. "Queer" sounded as snaky and mesmerizing as ever, "Vow" lacked no bite, and "Push It" lacked no urgency. "Only Happy When It Rains" and "Stupid Girl" were slightly re-imagined with more of an electro touch (the latter opened with a brief jaunt into Donna Summer's "I Feel Love"). When it came to the new, Not Your Kind of People was represented well enough with five songs, but with a two-hour set there was space for at least two songs from every album, and even a soundtrack single ("#1 Crush" from 1996's "Romeo + Juliet"). During the show, Shirley mentioned more than once how much the band was in awe to be able to be functioning as a unit and touring successfully again, after a many-year hiatus that preceded the release of Not Your Kind of People. Many of their contemporaries in the same situation would have reason to be shocked by such a response. But finally catching my first Garbage show made it clear why it's working for them, and why people are bound to keep showing up.